This Editorial voices strong support for SFPark's performance pricing project. It is from San Francisco's Examiner newspaper. Parking meters also have been adjusted under SFpark. High-demand meters can cost drivers up to $4.75 an hour under the current pricing structure. But drivers willing to park a little farther from the hustle and bustle can pay as little as 25 cents per hour. Before, motorists who parked in spaces on the fringes of commercial districts still had to pay the same rate as those who parked in the middle of the action. Now, such drivers receive a discounted rate. Does that sound like something your city could embrace? I have previously explained the basic idea of performance pricing. 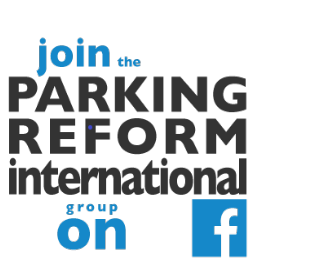 You can also learn more by reading all the Reinventing Parking posts with the tag 'performance pricing'. Residents across San Francisco are saying that the SFpark Pilot is an EPIC FAILURE, run by a $20M grant from the Federal Government, it has no oversight, and has done little outreach to find out what businesses and residents need for parking in their community﻿. SFPark has a fatal flaw, though: it relies on price signalling to function, but it doesn't communicate prices to end users effectively enough to affect their choices much. They only way for people to find out how much parking costs inside the SFPark system is to get out of their cars and check at the meter (problematic for obvious reasons) or to check with an app (illegal, for equally obvious reasons). I've seen some soon-to-be-published economic writing that argues that this failure of price signalling has erased most of SFPark's potential gains. It's like if you tried to go from Soviet rationing to a supermarket without the use of pricetags. Interesting point. I look forward to seeing that research. In theory, not everyone needs price information but 'enough' do. Does SFPark get the information to enough people? I don't know. In any case, price information would also seem important for public acceptance. So maybe an important issue to watch. One answer might be simpler versions of this approach to pricing. That raises different problems but does have the advantage that it is easier to convey the price information. See recent posts about Seattle and Calgary (which have larger price zones and fewer time-of-day price differences) here on Reinventing Parking. People do usually use same routes, and park at same locations at same time. Prices change once a moth or two. So I'm quite sure, that users learn all prices around their preferable destination very quickly and rarely have to check prices on the go.